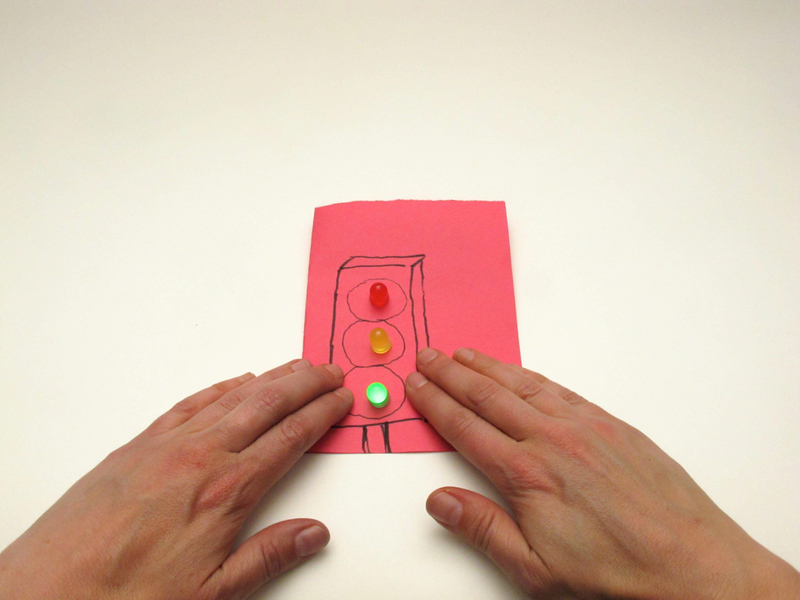 You may want to try the Make: Project Simple Paper Circuit first, which appears alongside this project on the one page paper circuit PDF, designed for easy reference in educational settings. Popularized by technology-oriented artists like Jie Qi and Evil Mad Scientist Laboratories, refined in places like the Tinkering Studio and nexmap, and now a wonderful product called Circuit Stickers, this lovely synthesis of art and technology is a great way to introduce artists to electronics, and engineers to art. Click on any maker link in this paragraph to discover their paper circuit resources. This Make: Project is just the beginning of what’s possible. Use the copper tape to make a design, try surface mount LEDs, use multiple LEDs in series or parallel, add an ATTiny85 microcontroller for programmable circuits, or even control bending wings. Conductive metal tape Made of copper or aluminum foil. Copper tape is also sold as "slug tape." LEDs (3) We used 10mm tinted "gumdrops." 6. Test your circuit and play! Fold your paper in half, then open it flat. One half will have the conductive tape circuit, and the other will have the LEDs. Fold one corner of your paper. Trace a coin battery. This will be your on/off switch. Electricity will flow through the conductive copper tape, connecting the positive + (anode) side of the coin battery with the + lead of the LED (usually the longer one), and the negative - (cathode) side with the - lead. Start your tape on the traced battery circle. Peel off the backing as you go. The adhesive (sticky part) of your tape probably does not conduct electricity, so bend (don’t cut) to make curves or corners. Starting on the other traced battery circle, run a line of copper tape next to your first line. Keep your tape lines close enough that the LED leads can reach across and touch both. The LEDs go between the tape lines. Mark the longer (+) lead with a stripe of permanent marker so you can keep track of which side is which. Mark LED locations with a pencil and poke through. Add the LEDs. All long (+) leads will need to touch the same line of tape. Spread leads flat. Tape the leads down the center. The leads must touch the copper tape to complete the circuit, so don't cover that part with tape. Add the battery. Clip in place with a binder clip. Step #6: Test your circuit and play! Fold your paper in half so the LEDs are above the tape circuit. To turn on an LED, press its two leads onto the copper tape circuit below.